Instantly download our complete collection of Campagnolo Catalogs, Parts and Technical Manuals, Instruction Sheets and More! Painstakingly gathered and scanned page by page. Nearly 4 Gigabytes and Thousands of pages. Divided into 6 Separate Archives all included and available for download at one price. Sales Catalogs reveal detailed specifications and pictures for use in component identification. With equipment so classic in design, part numbers and model numbers were not used. Proper component identification is essential in insuring compatibility and proper use. Parts Catalogs show exploded diagrams of components with individual parts and manufacturer part numbers. Part numbers often cross-reference to items available on other components and are invaluable when trying to locate replacements. Exploded diagrams are essential to correct restoration and re-assembly. Instruction Sheets show end user directions provided with retail packaged components since the mid 1980’s. Over 200 instruction sheet documents included. 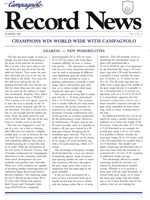 Please visit the official Campagnolo website for all current and recent products. 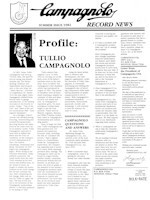 Campagnolo is the best source for the most accurate information. 80th Anniversary! Catalog, Spare Parts & Tools, 80th Spare Parts. Athena EPS! Catalog, Spare Parts & Tools, Technical Manual. Bullet Wheels! First Row: Catalog, Spare Parts & Tools. Second Row: Technical Manual, Spring/Summer Trade Apparel. Campagnolo adds Cyclocross! First Row: Catalog, Spare Parts & Tools, Apparel Look Book. Second Row: Technical Manual, Spring/Summer Trade Apparel, Autumn/Winter Trade Apparel. Athena is Back! First Row: Catalog, Spare Parts & Tools, New for 2010 Range, Spring/Summer Apparel. Second Row: 12-29 Cassette, Spring/Summer Trade Apparel, Autumn/Winter Trade Apparel, Tri-pro Pad. These go to 11! First Row: Product Range, Spare Parts and Tools, Spring/Summer Apparel. Second Row: Components Trade Catalog, Components Technical Manual, Spring/Summer Trade Apparel, Autumn/Winter Trade Apparel. 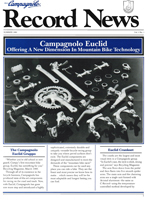 75 years of Campagnolo! First Row: Product Range, Spare Parts and Tools, Spring/Summer Apparel, Fall Winter Apparel. Second Row: Components Trade Catalog, Spring/Summer Apparel Trade Catalog. Ultra-Torque. Need we say more. Focus on more carbon in components and improvements in shifting and drive train. The new 5.9mm Chains offered at different group levels are released. Improvements and expansion of carbon products. Beginning of cross-bike products with flat bar levers. More carbon in Record. Some old Record carbon moves to Chorus. Some old Chorus moves to Centaur. Veloce introduces 10 speed. Daytona Group is re-named to “Centaur”, a name previously used for a Campagnolo off-road group. The use of the name “Daytona” was previously trademarked. Light action rear derailleur/shifting system & Ultra Drive Cassettes incorporated into all 9 Speed lines. Mid-year introduction of 10 Speed light action rear derailleur and Ultra Drive Cassettes. 9 Speed continues with previous shifting/derailleur system until next year. Introduction of the Record Carbon Ergo Levers. Last year of Athena. Introduction of Next generation Ergo Levers. First year of the Record Titanium rear derailleur. Introduction of Group names printed on componentry. Introduction of Low Profile Cranksets. Both small (A4 folded) and large (A4) versions of this catalog are included. Sometimes considered the last (and best) year of the “C-Record” era. This is the last year Components did not have the group name printed on them. It is also the last year some components are still the original C Record design including the crankset, front derailleur, front hub and seat post. It is also the FIRST year of Exa-Drive, with new chainrings, cassettes, Sachs chains, guided upper pulley and a ramp on the inner cage of the front derailleur. Two different covers were made for the product catalog (shown). They were identical inside. BONUS! Technical manual detailing disassembly & rebuild of first generation ErgoLevers! Introduction of rear derailleur with lower pivot on the inside. Late 1993 introduction of Record Dual pivot calipers (see addendum sheet). The first year of Ergo Power Levers. 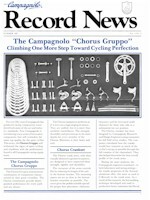 First and foremost, Throughout the early “C-Record” Era, Campagnolo was not offering a chain or an updated freewheel. Regina’s offerings were usually the item of choice. Campagnolo’s early index shifting systems are reputed to work best with Regina Syncro freewheels and asymmetrical chains. Secondly, Regina’s failed attempt at a road component group shown in this catalog is representative of the final split between Campagnolo and Regina. In this same time period, Campagnolo has begun stamping-out it’s own Cassettes, and re-boxing chains made in Germany (Rohloff) as their own. No changes in 1990 for Record, Croce D’Aune and Chorus. No updated catalogs for these groups. Euclid and Athena catalog dated 4/89. New for 1990 is the Xenon Road Group Dated 6/89, and the Centaur MTB group dated 4/89. Record & Croce D’Aune dated March 1988, Chorus & Athena dated April 1988, Euclid dated September 1988, Rims dated November 1988, Syncro & Synt dated February 1988. Croce D’Aune & Chorus contents identical to previous year. BONUS! 144 Page Dealer Parts Catalog! Sometimes referred to as Catalog 19. Catalog contains exploded assembly views of all components and detailed parts break-down and assembly. The only known parts information available for late 1980’s equipment, these catalogs were individually serial numbered and distributed only to authorized dealers in a hardcover binder. No further Parts Catalogs exist for years after due to a largely un-followed plan for Dealers to request updated pages as needed. 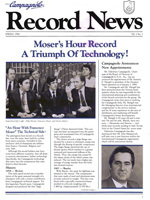 Record is dated February 1987, and is otherwise IDENTICAL to the 1987 Catalog below. 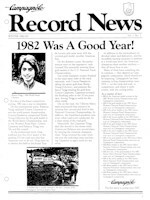 Nothing new for 1988 Record. Introduction of Croce D’Aune dated November 1987. Introduction of Chorus dated July 1987. Record dated November 1986. Record Delta Brakes are back. Logos are now printed on the crank arms and Delta caliper covers instead of being engraved. Nuovo Catalog identical in printings from November 1986 and February 1987. Upgrades in both Nuovo groups from 1986 consist only of leather toe straps, black brake pads & a polished BB axle. Syncro Catalog identical in printings from November 1986 and February 1987. Special Item – 1st Gen. “C-Record” Instruction Books! Un-dated Brochures. Delta Brakes are temporarily replaced with “dressed-up” the 50th Anniversary Super Record Brake calipers with a Cobalt-colored (“Cobalto” in Italian) gem instead of the gold badge on the center bolt. Also, the Campagnolo name on the arm is filled with blue. Only the Cobalto Calipers are offered at this time and are pictured in the Record flyer. The next two catalogs both show Cobalto calipers and as such are probably both catalogs from 1986. Rims catalog also seems to be from this period. Undated Brochures. Content of the white catalogs compared to 1986 catalogs seems to indicate these simply may not have been final revisions. First use of the Campagnolo Alphabet, and the only year the alphabet character was placed above the Campagnolo Logo. Addendum to Catalog 18 for the introduction of the new component groups. This catalog dated December 1986. There is an identical catalog dated April 1985. 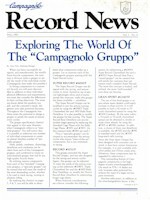 This catalog identified the Record road components as the “Record Corsa group”, and the Track Components as “Record Track group”. While the Italian word “Pista” was correctly translated to “Track”, the word “Corsa” was not translated to “Road”. This possible “Typo” may be the basis for the nickname “C-Record”…. a name that never actually appears in product catalogs by Campagnolo. The Introduction of “C” Record, Victory & Triomphe equipment. 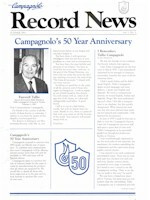 The Cerchio (rims) catalog is undated but has one page identical to a rims page in the main catalog, so it is assumed to be 1984 despite the use of the older world logo on the cover. Dated December 1986, There are identical versions from earlier printings with dates of December 1985 and May 1984. Campagnolo Olympiad Engagement Calendar – detailing the spirit of the 1984 Olympics. Campagnolo introduced it’s serial numbered & signed limited edition group for the company’s 50th anniversary. Grouppo number 0002 was presented to His Holiness Pope John Paul II in a private ceremony on June 15th, 1983. Un-dated catalogs from the early 1980’s. 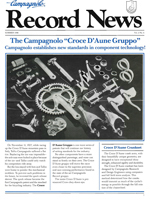 Technology Catalog, Campagnolo Wins in all the world, Campagnolo Gruppi. Regina? 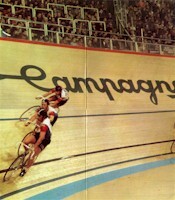 If you’re wondering why this would be on Campagnolo pages, you were probably wearing diapers when these bikes were new. 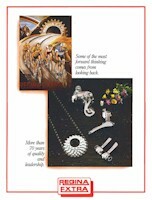 Campagnolo had never yet ventured into cogs and chains. Regina was our old Italian faithful and for most Vintage Campagnolo bikes probably still is today. Super Record updates. Second one is a photocopy of a later edition that had a few extra pages. Actual Catalog 17a – plus a second Catalog containing the bicycle equipment pages from Catalogue No. 17a as reproduced in 1976 by the U.S. Authorized Distributor Hans Johnsen Company of Dallas, Texas. 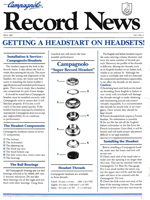 Published by Olympic Resources, Inc. in Houston, Texas. 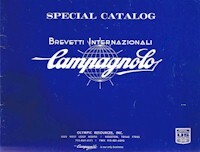 One of Campagnolo’s most comprehensive catalogs of the time at 96 pages. Containing Velox, Valentino, Gran Turismo, Comando Elefante (a Schwinn Stingray style gigantic top tube shifter), Superleggeri Pedals, Seatpost & pump end, Sport crankset and headset, Disc wheel cover and gear charts for 27 inch wheels. Dated November, 1971. 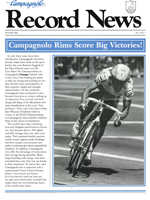 Containing the Nuovo Record derailleur as part of the record group and pre-dating Super Record. Scans taken in a manner to preserve original document. Good reading in Italian! Second document is the rare four language translation pages in French, English, Spanish and German. Separate document in original size so you can print it on A5 pages. Scans taken in a manner to preserve original document. See sample for scan quality.